The Jumpstart Our Business Startups Act is a new law that provides companies with more access to fundraising, new kinds of investors and fewer regulatory burdens. NEW YORK (CNNMoney) -- It will soon be easier for small companies to raise money just like behemoths on Wall Street. More access to fundraising, new investors and fewer regulatory burdens are all part of the Jumpstart Our Business Startups bill, which President Obama signed into law Thursday. The JOBS Act, which received bipartisan congressional support, provides small businesses that need capital with many options that were previously out of reach. The provisions are aimed at helping fast-growing operations like biotech and tech companies, but mom and pop shops may benefit as well. The Securities and Exchange Commission has several months to pass regulations fully implementing the law. For startups or entrepreneurs in need of initial funds to launch an idea, the law redefines crowdfunding. Previously, platforms like Indiegogo or Kickstarter offered companies a way to raise money from everyday folks. But contributors couldn't buy shares in a company itself and take part in its profits and losses. The new law allows a company to use crowdfunding for seeking actual investors. It can raise up to $1 million this way. To protect investors, those with a net worth of less than $100,000 may now invest 5% of their yearly income or $2,000, whichever is higher. Wealthier types can invest up to 10% of their income. "There's more reason for an investor to give them money," said Matthew Kaplan, a capital markets lawyer in New York. "They'll get a piece of the upside." Crowdfunding helped San Francisco clothing and accessories company Solz raise thousands in donations in the past. CEO Brad Carrick expects the new law will open up the possibility to sell small shares of his company for $1,000 to $10,000. "When you pull these people together, you can get a mini-angel investment round," said Carrick, referring to venture capital that plays a crucial role in funding startups. Several parts of the law are also aimed at helping a well-established small business more easily find accredited investors, those with a net worth of $1 million excluding the value of their primary residence. The law lifts a ban on advertising to the general public about investment opportunities, no longer forcing companies to hire brokers. "That's huge. When you're talking about a small business with 30 employees, you don't have time to establish those connections to bring in chunks of money," said Molly Brogan, spokeswoman for the National Small Business Association, which lobbied for the law's passage. Meanwhile, critics such as the AARP, a lobbying group for seniors, oppose lifting the advertising ban, worried it will lure in unprepared investors and lead to fraud. Finally, for companies in later growth stages, the law eases the process for publicly selling stock. Having 500 investors or raising $5 million previously forced a company to register with the SEC -- a costly endeavor. Filling out stacks of legal forms and undergoing independent accounting audits can cost hundreds of thousands of dollars. The law loosens requirements for most companies by raising several thresholds. A company with $10 million in assets will now have to register with the SEC when its number of investors reaches 2,000, including 500 who don't meet the "accredited" wealth requirement. And companies with less than $1 billion in annual revenue can enter a five-year phase-in plan with the SEC. 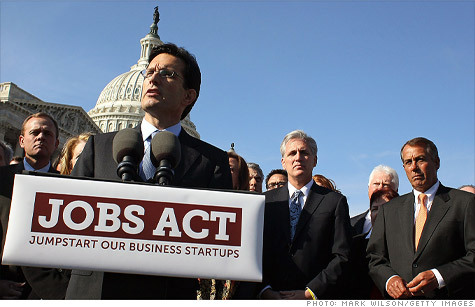 Kaplan said that will let small companies on their way up retain the strength they need to survive the trip. "It enables you to gestate longer," Kaplan said. "History is littered with examples of startups that went public and crashed and burned, because they didn't have time to develop processes or market presence to sustain themselves as a public company." That provision is welcomed by Boulder, Colo., software developer Rally Software, which has spent more than $1 million in accounting fees since 2010 to maintain the option of going public. The CEO of the 300-employee company, Tim Miller, said the JOBS Act would make the process less expensive.